This incredible picture is of Stephanie. 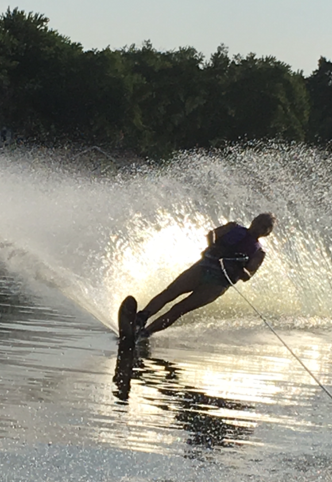 She is a 66 year-young StrengthTime client and boy – can she water ski! Stephanie credits her workouts at StrengthTime with her ability to continue her love of skiing. She proudly explains that her workouts have not only let her maintain her ability to water ski but have also actually improved her technique. I have another client, who at 73 still snow skis for much of the winter. She is a firm believer that her StrengthTime workout has enabled her to continue this sporting passion. She loves the fact that she can impress her grandchildren with her abilities! These two clients provide great examples of the power of StrengthTime. We all know the benefits of exercise are indisputable (If you go the StrengthTime tab on this website and then choose “Benefits” you will be able to read a thorough explanation.) However, It is one thing to read about it and understand the value of strength training, but it is another thing to see it in action. Strength training as you age can enhance your quality of life and enable you to continue the activities you love. It is inspiring to witness the passion that these two clients have for skiing and so rewarding to help them pursue their goals. My 22-year-old daughter came to me with goals of her own. She enjoys going with friends to the local rec center for yoga, spinning and boot camp. It has a social component that she loves and is a great after-work activity. As much as she likes going to the gym, she doesn’t want to do weight training there. I was so pleased that she wanted to continue her StrengthTime sessions even though she joined the rec center. She appreciates the one-on-one training (even with her Trainer Mom) and likes the secure feeling she has lifting weights with a professional. Of course, I jumped at the chance to continue training her and she loves the way StrengthTime enhances her other workouts. As you may have guessed, my goal is to help clients achieve whatever they strive for. As a StrengthTime Trainer, it is rewarding to be a part of my clients’ unique stories.